Photograph courtesy Tom Sutch 25069 & 25068 stand at Springs Branch on May 7th 1974 after working the Royal Train to Lowton for stabling. Close investigation of 25069 reveals that the painters have picked out in white paint almost everything they could find, from the wheel rims to the footsteps, lamp brackets and even the windscreen wipers! The twenty year four month career of D5129/25069 was spent allocated to a small number of London Midland Region depots, with all but three months allocated to London area depots. 11th remaining vacuum braked Class 25 in service (jointly with 25084 & 25140). Time between last Classified repair and withdrawal: 81 months. Time between withdrawal and scrapping: 30 months. October 1963 to Cricklewood West (14BC). June 1968 to London Division (D01). 25069 was the 206th Class 25 withdrawn, one of six retired during December 1983. After withdrawal 25069 was stored at Springs Branch from December 1983 until moved (see detail below) to Swindon Works on February 21st 1985 and scrapped there by the third week of June 1986. 25069, 25221 (SP) & 25318, 25236 (CD) Springs Branch - Crewe – Swindon Works February 20th-21st 1985. Noted Derby Works January & February 1977 (Classified & full repaint). An early passenger working for D5219, with D5210 took place on July 3rd 1966 working a Bedford - Nottingham charter. On March 11th 1970 a Leicester - Gatwick Airport extra was worked by 5219 & 5222. Three days later (14th) 5219 & 7537 worked a 16 coach Barrow - Kensington Olympia hockey match extra forward from Willesden. Condition June: green livery with frame level stripe, full yellow cabfronts, gangway doors fitted. Royal Train duty befell 5218 & 5219 on February 14th-16th. The Duke of Edinburgh journeyed from Euston, at 23.00 to Sheffield via Northampton & Leicester. Twenty four hours later he returned to Lamport, near Market Harborough, with the five coach train stabling overnight, before leaving at 7am for Leatherhead via the west London line, Clapham Junction, Selhurst, West Croydon & Sutton. On return the Class 25s ran through to Dorking, there running round heading back to Wolverton via Sutton, Mitcham Jct & Clapham Jct. Overnight heating was provided by a heater van delivered by 5221. Photograph collection of webmaster How many times have we looked over a bridge parapet, a lineside fence or wall and come across the unexpected? Here is just such an event at Leatherhead on February 16th 1973 as 5219 & 5218 handle the Royal Train. Condition April: blue/yellow livery, gangway doors present. A Euston - Norwich mystery excursion on April 6th 1974 was worked by 25069 & 25068, route presumed to be out via Northampton & Peterborough and back direct to London Liverpool Street. On May 6th 25068 & 25069 were used to take Her Majesty The Queen, on the Royal Train from Scunthorpe to Lowton. On May 11th 25068 & 25069 worked the 12.50 Nottingham - St. Pancras. On November 5th the empty Royal Train was taken to Kings Lynn by 25069, the locomotive returned south whilst the Royal Train later headed out to Balmoral with 47179 in charge to Arbroath. The next day this train was noted at Dundee behind 27004 & 27107, both in immaculate condition. On November 27th 25068 & 25069 were noted in the East Midlands area with a Royal Train (further details needed). On November 29th 25068 & 25069 (assumed) the four coach Royal Train was worked from Whitchurch to Liverpool conveying the Duke of Edinburgh. 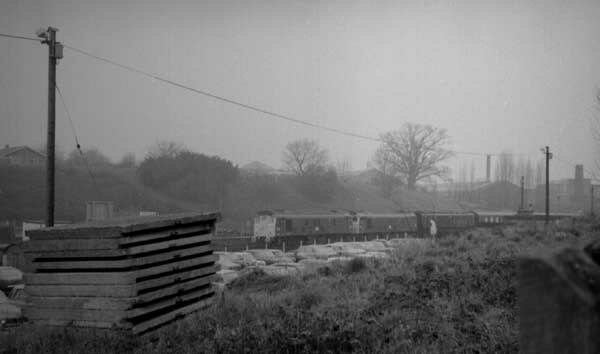 The empty stock was then taken to Wolverton. On August 6th 1977 25069 & 25316 worked the 08.00 Walsall - Yarmouth to Norwich and the 14.15 Yarmouth - Walsall from Norwich. Wolverton Works held an Open Day on August 20th which besides featuring its regular diet of coaches and electric multiple units had 25069 and 81004 specially brought in for display. 'The Dukeries Limited' railtour was worked from Euston to Wembley Central on October 22nd 1977 by 25069 & 25081. November 18th found the 20.50 Tyne – York operated by 31233 & 25069. On November 25th 1978 25069 & 25058 worked the 07.46 Barnstaple - Exeter St. Davids. 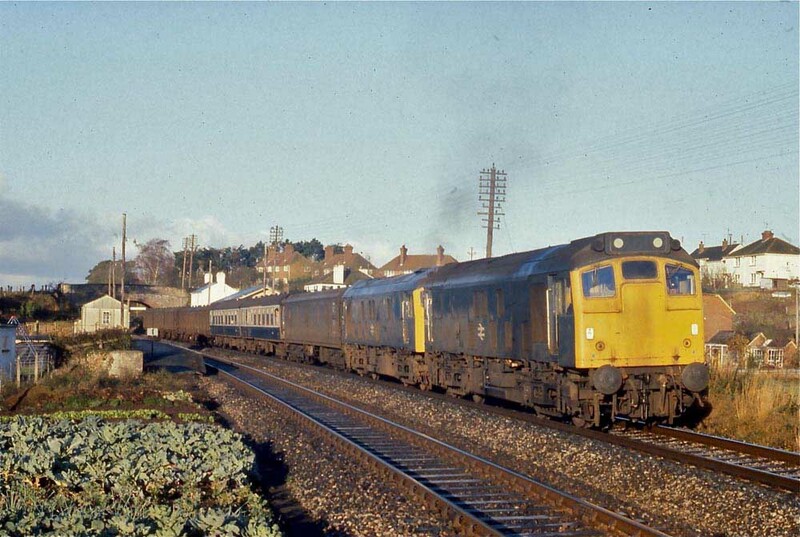 Photograph courtesy Peter Lovell On November 25th 1978 25069 & 25058 pass Newton St Cyres with the 07.46 Barnstaple - Exeter mixed service. In this case the two passenger coaches are sandwiched between several parcels/mail coaches. 'The North-West Rambler No.2' railtour on a wintry January 13th 1979 was worked by 25069 & 25040 from High Wycombe to Basford Hall Sidings, it should have started from Marylebone but the late arrival of the stock saw a diesel multiple unit fill in as far as High Wycombe. 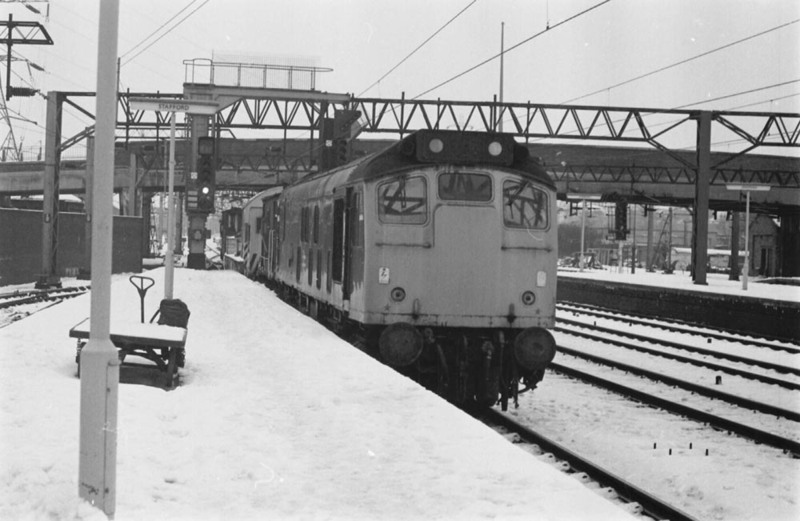 Photograph courtesy Barrie Watkins Snow is on the ground at Stafford on January 22nd 1979 as 25069 runs through the station with what appears to be a short engineers train. December 12th was a poor day for Class 25 reliability in the Northampton area. Included in the problems was 25069 on the 07.35 Northampton – Three Spires when the forty eight wagons were too much for the Type 2 and became stuck near Althorp. Assistance came in the rear from a following Willesden – Bescot freight, pushing as far as Rugby. On December 19th the 07.47 Manchester Victoria Bangor and the 11.30 Bangor - Manchester Victoria were handled by 25069. During January 25069 received an 'E' examination at Cricklewood. 1980 produced quite a mixture of workings. On March 9th the 18.35 Birmingham New Street - Norwich was worked at least as far as Leicester by 25069. Diesel multiple unit shortages on March 13th saw 25069 with hauled stock work the 17.22 Crewe - Nottingham. Two days later (15th) 45025 failed at Burton on the 18.06 Penzance - Leeds, 37155 took the train on to Derby where 25069 worked forward to Leeds. On June 28th the 08.42 Sheffield - Huddersfield and 16.58 Huddersfield - Sheffield (being connections off the summer dated York - Llandudno and return) were worked by 25069. The failure of 40108 at Abergele & Pensard on July 17th working the 13.40 Manchester Victoria - Llandudno Town required the assistance of 25069 to complete the journey. The 13.15 Birmingham New Street - Norwich was worked by 25069 on November 29th, whilst on December 17th (?) an unidentified Morecambe - Leeds service was handled by 25069. Engineering work at the southern end of the WCML during January & February 1981 created a number of passenger workings for 25069. Remarkably these all seemed to feature the 20.45 Barrow - Euston between Rugby & Euston (Jan 11th & Feb 1st) and Bletchley & Euston (Jan 18th, 25th and Feb 8th). On May 10th the 02.25 Euston - Bletchley was worked by 25069. The remainder of the workings for 1981 featured 25069 many miles from its Cricklewood home. On June 27th 1981 25069 & 25032 worked the 08.35 Derby - Yarmouth to Norwich, returning with the 14.20 Yarmouth - Derby from Norwich. The Cambrian lines were visited next, on July 11th 1981 the 04.10 Shrewsbury - Aberystwyth and the 10.07 Aberystwyth - Euston to Wolverhampton were worked by 25069 & 25032. The next day (12th) the same pair worked the 08.45 Birmingham New Street - Aberystwyth and the return 18.00 Aberystwyth - Euston to Nuneaton. A Leicester - Skegness roundtrip was worked on August 1st by 25069 & 25081. On November 18th 25069 worked a Manchester Victoria - Bangor, whilst the next day (19th) it worked 17.15 Manchester Victoria - Blackpool North. The end of the year saw 25069 many miles from Cricklewood working services on the Leeds - Morecambe route with hauled stock; on December 29th & 31st it was the turn of the 08.30 Leeds - Morecambe and the 11.34 Morecambe - Leeds. 25069 was noted northbound at Preston with a comdemned Mk I coach on February 17th. Six days later on the evening of February 23rd 25069 was noted southbound at Huntingdon with 313001. 25069 was north of the border for a couple of workings during July 1982; on July 3rd it worked the 17.22 Carlisle - Glasgow Central, whilst on July 19th it was the turn of the 11.55 Glasgow Central - Carlisle. On August 18th 25069 worked the 15.45 Manchester Victoria - Bangor. On September 11th 25069 worked the 07.45 Manchester Victoria - Bangor. During the early afternoon of October 12th 25069 and an inspection/instruction were noted at Richmond (LT/NLR side), staying briefly then departing towards Kew Gardens. On October 13th the 17.43 Nottingham - Leicester. 1983 was the last year in service for 25069, a variety of passenger workings were handled. The first working for 1983 took place on January 19th with the 17.45 Manchester Victoria - Llandudno Junction. On March 2nd 25069 worked the 08.57 Leeds - Carlisle and 15.37 return. A month later on April 2nd 'The Yorkshire Pudden' railtour from Plymouth was worked by 25069 & 25027 between Derby & Milford Sidings (out) and between Wakefield Kirkgate & Derby (back). On June 1st 25069 worked the 19.30 Crewe - Cardiff, the next day (2nd) the 05.35 Cardiff - Crewe and 10.03 Crewe - Cardiff. 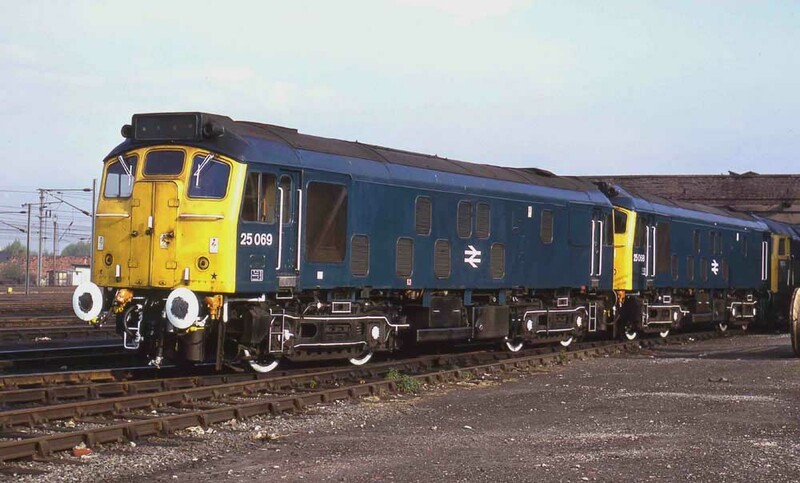 A diesel multiple unit failure on July 8th saw 25069 working the 16.37 Derby - Crewe and 18.20 return. The 16.06 Crewe - Cardiff was worked on August 31st. On August 25th 25069 was noted westbound at Findern with a train of 28 empty mineral wagons. On August 26th 25069 worked the 4V20 15.10 Manchester Piccadilly - Bristol Temple Meads parcels. The 15.05 Blackpool North - Kilmarnock charter was worked to Preston on September 12th. Two strange workings followed, on September 18th 25069 was added to the 17.55 Cardiff - Portsmouth Harbour as far as Bristol Temple Meads, 33024 was the train engine. The next day (19th) 25069 worked the 06.45 Cardiff - Portsmouth Harbour forward from Bristol Temple Meads, returning with the 12.10 Portsmouth Harbour - Cardiff to Bristol Temple Meads. At some point during September 25069 was dispayed at Salisbury as part of an exhibition. 25069 was stabled at Old Oak Common on October 8th. 25069 was noted light engine at Newcastle station on November 2nd. Two days later on November 4th 25069 worked a late evening Middlesborough - Neville Hill exhibition train. Finally, for this Cricklewood locomotive its last two passenger workings took place November 10th working the 10.40 Carlisle - Leeds and 16.00 Leeds - Carlisle. 25069 was withdrawn on December 18th 1983. No.1 cab: driver's side corner: missing corner valencing and dents: (not present August 1981), August 1982 until withdrawn. BIS side: damaged bodywork to left of Battery Isolating Switch cover: 1980 until withdrawn. Page added August 4th 2013.